While visiting my cousins, they allowed me to use their tools to make some mods to Tardis. This made the work much easier to do and it went quicker too. The results were just what I had imagined. A pantry was added between the galley and the door to the head. It is fashioned after the one Andy Baird describes in his Eureka book. However, the dimensions and details are slightly different for mine. I made the door the same size and height as the adjacent one. It is slightly wider than the shelves, so it can be gripped on the edge to open, thus eliminating the need for a handle. Magnet clips were used to keep the door closed, and an eye-hook latch was added to prevent the door opening when driving. Wooden retainer lips on the 8 fixed shelves were used along with that rubbery non-slip shelf liner to keep items in place. Thin outdoor carpet on the rear wall prevents scratches and rattling. 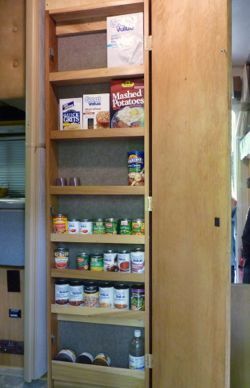 At the top is an open box for stowing odd items which is concealed by the door. This addition provides considerably more storage for packaged food items, and frees up the existing cabinets for other uses. The ladder to the loft bed came with hard rubber pads on the rungs, which made the climb with bare feet painful. To make them softer I wrapped them with two layers of the same thin outdoor carpet used in the pantry. The padding is secured with cable ties. Now my tootsies will be happy getting in and out of bed. A box to hold the printer-scanner was made to fit under the table and between the two couches. It was sized just deep enough to hold the printer, and a height so the lid could be opened completely. There is a lip around the edge to keep the printer from sliding off. 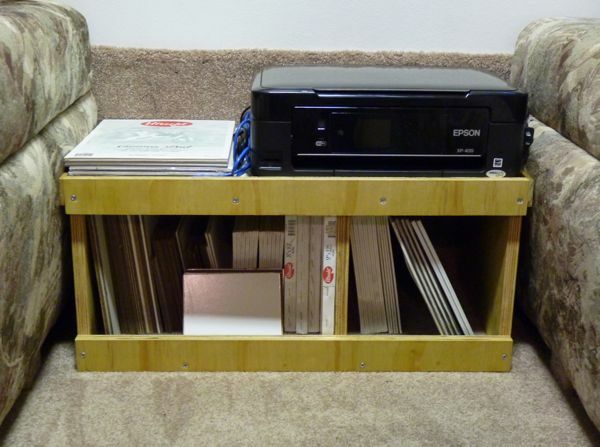 Below are two storage bins for holding paper and painting panels. The location may seem odd. But, it is very convenient to my work station, and is still back far enough to allow sitting at the table. 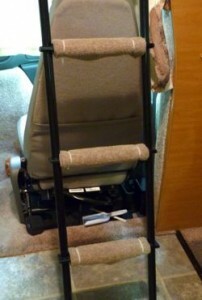 These three handy mods were done before leaving Florida, and will make traveling in my RV so much more enjoyable. I’m so glad I got them done early in my journey. Your tweaks look real nice – you seem to be fitting right in with the lifestyle- travel safe.